The Mazda CX-9 has been an award winner since the mid-size SUV’s second generation was introduced in 2016. That standout performance continues with the 2018 Mazda CX-9 and its impressive list of updates and refinements. There’s an enhanced selection of driver-assist and safety features, including the debut of Smart City Brake Support as standard equipment on all Mazda CX-9 models. SCBS, a technology that can automatically brake in emergency situations, is part of Mazda’s i-ACTIVSENSE suite of safety systems. Blind Spot Monitoring and Rear Cross-Traffic Alert are also now standard. You’ll find plenty of opportunities for customizing your Mazda CX-9 driving experience. The 3- row crossover offers 4 trim levels: Sport, Touring, Grand Touring, and Signature. An assortment of packages and options allow you to truly apply a personal touch to the exterior and interior. Werner Mazda goes above and beyond to serve drivers in the greater Manchester, NH area with the utmost concern and respect. A commitment to customer service drives our efforts to make your car-shopping experience is the very best. We have a great selection of Mazda CX-9 vehicles and other new and Certified Pre-Owned Mazda models. All Mazda CX-9s have Mazda’s fuel-efficient SKYACTIV®-G 2.5T turbocharged 4-cylinder engine as standard equipment. The power plant cranks out 250 horses while still providing outstanding gas mileage. It’s tuned to deliver maximum power at low speeds, so it’s peppy and responsive whenever the gas pedal is depressed. The engine is paired with Mazda’s 6-speed automatic SKYACTIV-DRIVE transmission and front- wheel drive is also standard on the Sport, Touring and Mazda CX-9 Grand Touring models. 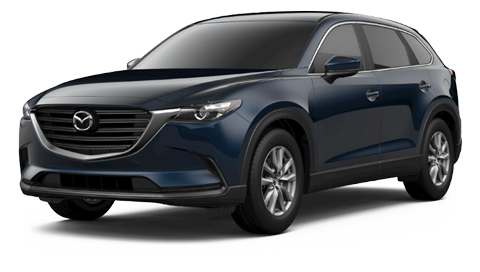 Standard on the top-of-the-line 2018 Mazda CX-9 Signature is the predictive i-ACTIV all-wheel- drive system, which is optional on other trim levels. Also new to all Mazda CX-9 models for 2018 is Mazda’s G-Vectoring Control, which uses the engine, steering and throttle inputs to slightly reduce engine torque and place more weight on front wheels to enhance traction and steering. The result is a feeling of more control when you’re behind the wheel. Test-drive the new Mazda CX-9 at your preferred Manchester car dealership, Werner Mazda. Important driver-assist features such as Blind Spot Monitoring and Rear Cross-Traffic Alert are found on all 2018 Mazda CX-9s. So is, of course, the i-ACTIVSENSE suite of advanced safety features. i-ACTIVSENSE uses cameras and radar to help drivers recognize potential hazards, avoid them when possible and reduce their severity. Standard on the Touring and higher models, the Full i-ACTIVSENSE suite includes High Beam Control, Lane Departure Warning, Lane-Keep Assist, Mazda Radar Cruise Control with Stop and Go function and Smart Brake Support. The MAZDA’s CONNECT™ infotainment system makes staying in-touch, informed and entertained as simple as can be. It comes standard with a full-color, 7-inch touchscreen, Bluetooth® audio streaming, phone pairing and more. Among the available as options are such things as a BOSE® 12-speaker surround-sound audio system, SiriusXM® satellite radio and a navigation system. The now-standard leather-wrapped steering wheel and shift knob are subtle indicators of the care taken instill refinement in the design of the Mazda CX-9’s cabin. And the Mazda CX-9 is indeed spacious, with seating for up to 7 adults in its 3 rows, and it offers more second- and third-row legroom than the Acura MDX or Toyota Highlander. The third row can be easily accessed, so children can easily climb in and out without having to remove an installed child seat. A 50/50 split third row and 60/40 split second row provide plenty of room for all your cargo and passengers. Both rows can be folded flat for up to 71.2 cubic feet of storage. There are also hidden storage bins in the console, center armrests and glove box, along with seatback pockets and door-panel bins. The CX-9 Sport features cloth seating, a 2-position memory, power driver’s seat, a 6-way power adjustable passenger seat, and heated front seats. The Mazda CX-9 Touring’s Premium Package includes a sunroof, retractable sunshades in the second-row doors and a moonroof, a tilt function driver’s seat and a power passenger seat with lift and lumbar support. The 2018 Mazda CX-9 has the striking looks that grab the eye whether it’s at rest or in motion. There are 7 options for personalizing your CX-9’s exterior: Machine Gray Metallic, Soul Red Crystal Metallic, Snowflake White Pearl, Sonic Silver Metallic, Titanium Flash Metallic, Deep Crystal Blue Mica, and Jet Black Mica. 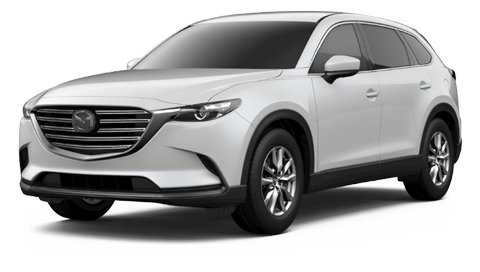 To get a first-hand experience with the 2018 Mazda CX-9, stop by Manchester’s trusted Mazda dealer, Werner Mazda. Our sales staff will be pleased to serve you, whether it’s a new vehicle or pre-owned. And our service department takes pride in helping keep vehicles in excellent running condition.